Want to be notified of new releases in khanhas/Spicetify? Tool to customize Spotify client UI and expand functionalities. Supports only Windows. Note: Only Spotify normal version is supported. Windows Store version is under a write permission required folder so I can't make it work. Normal Spotify installer can be downloaded here. To sastify any web developer that has experience with CSS, Inject CSS option will allow you to customize your Spotify client even more. Note: If you prefer original Spotify UI, please clear user.css file or uncheck Inject CSS. To use color variables, check out Custom CSS wiki page. If you have multiple themes in Themes folder, click at back and next buttons to rotate through all of them. You also can create new theme and duplicate current theme instantly by using right mouse context menu. For Rainmeter user only. Works exactly like WebNowPlaying Companion for browser, get song information and control player directly with WebNowplaying plugin. Check out Extension wiki page for list of useful functions, object. Check out App wiki page for some app making tips. 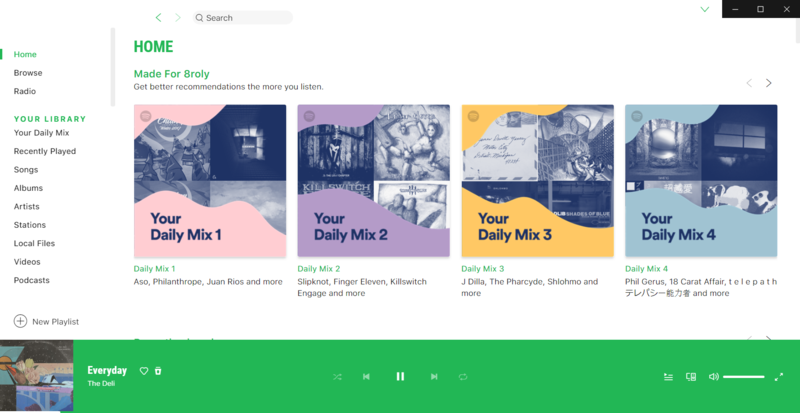 Spotify UI is HTML/CSS and runs inside Chromium Embedded Framework. All CSS files controlling element attributes and interaction are packed in SPA files (they basically are ZIP). These CSS files are extracted first then go through a preparation process that finds and replaces almost all colors with specific keywords. When user applies his/her own colors scheme, all keywords are replaced with actual colors value, both in hex and RRR,GGG,BBB format. After that, modded CSS and remaining files are transferred back to Spotify directory. Install Rainmeter if you have not. Download this repo and unzip to Documents\Rainmeter\Skins. Everything you need to run is already in repo. 3. (Optional) Install Nodejs and yarn to run/install some tools and scripts that make development process easier. Thanks for his script that this skin is based on. Thanks for his and .